Shop Bistro MD online at BistroMD.com where weight loss has never been so tasty, or so easy, with delivery of doctor-designed gourmet diet food to help you lose weight. BistroMD.com is a specialized weight management source offering weight loss programs with unique meals and snacks, in addition to a weekly information program that will break down the science behind losing weight. Bistro MD's meals are fully cooked, portion controlled, perfectly balanced and prepared while working under Doctor's tight nutritional guidance. Check back often at 58Coupons.com for the best Bistro MD savings, Bistro MD discounts, Bistro MD promotions and Bistro MD coupons for helping you lose weight at BistroMD.com. Save 10% on gourmet home delivery from Bistro MD with this promo code. Click to save. Save on your first week at Bistro MD and get 20% off with this limited time code. Get $75 off any meal plan from BistroMD with this limited time code. Enjoy free shipping from Bistro MD with this code when you spend $25 or more! Click link. Get a $50 Credit from BistroMd when you refer a friend. Click link and click Refer a Friend. Join BistroMD.com today and get a free meal with your first order. Click link for details. Get your Free diet profile from BistroMD.com and learn exactly what you need to do to achieve the results you want. Click link for details. 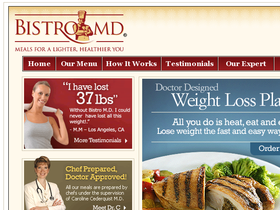 Act now and you can start losing weight with BistroMD.com for as low as $19 per day. Click link to get started.